In his Village Voice "Movie Journal" columns, Jonas Mekas captured the makings of an exciting movement in 1960s American filmmaking. Works by Andy Warhol, Gregory J. Markapoulos, Stan Brakhage, Jack Smith, Robert Breer, and others echoed experiments already underway elsewhere, yet they belonged to a nascent tradition that only a true visionary could identify. Mekas incorporated the most essential characteristics of these films into a unique conception of American filmmaking's next phase. He simplified complex aesthetic strategies for unfamiliar audiences and appreciated the subversive genius of films that many dismissed as trash. This new edition presents Mekas's original critiques in full, with additional material on the filmmakers, film studies scholars, and popular and avant-garde critics whom he inspired and transformed. Jonas Mekas is a filmmaker, critic, and poet who lives and works in Brooklyn. His "Movie Journal" column ran in the Village Voice from 1958 to 1975. 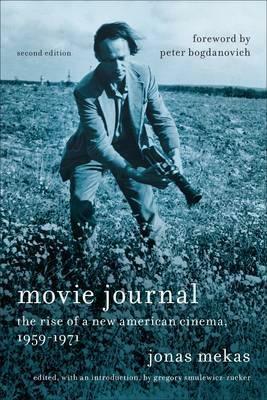 In 1954, he cofounded the journal Film Culture. His major films include The Brig (1964), Walden (Diaries, Notes, Sketches) (1969), Reminiscences of a Journey to Lithuania (1971), and As I Was Moving Ahead Occasionally I Saw Brief Glimpses of Beauty (2000). Peter Bogdanovich is an American director, writer, actor, producer, critic, and film historian. Gregory Smulewicz-Zucker is the managing editor of Logos: A Journal of Modern Society and Culture.